The Chateaux was the last built of the high-rise condominiums called the Village at Breckenridge. Located in the curve of Village Road and Park Avenue, the backyard of the Chateaux condos for sale is the ski school meeting area; out the front is downtown Breckenridge. Part of the Village at Breckenridge, the Chateaux has access to an indoor and outdoor pools, hot tubs, 24-hours concierge and front desk, on-property restaurants, fitness center, meeting rooms, underground parking and a ski valet service. There are no studio, or hotel-room style condos in the Chateaux – all are 2 or 3 bedroom units. Check out the available Chateaux condominium listings found below, or learn more about this desirable community. After a year of renovation in 2010, the exteriors of all buildings have been completely updated, the lobby and check-in areas greatly improved and a large clock tower added. 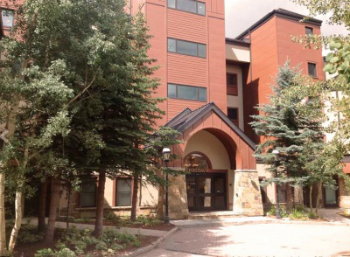 Begun in 1979, finished in 1984, The Village at Breckenridge is still one of the largest condo complexes at the ski area, and one that offers the most in-house, hotel-style amenities. Any Chateaux condo for sale is a property that can generate good short-term vacation rental income for its owners. The base of Peak 9 is just outside the door making the Chateaux truly ski in and ski out. 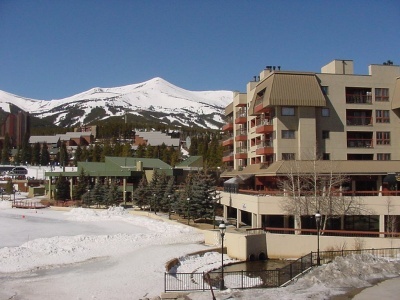 The ski area bus and town shuttle stops on Village Road near the Chateaux and offers transportation to the other peaks of the Breckenridge Ski Resort, and connections around the county. Chevy Chase and the production crew for the movie Christmas Vacation stayed at the Chateaux while filming outdoor scenes in Breckenridge in 1989. Size: 1226 sq. ft to 2097 sq. ft. Amenities: directly between the base of Peak 9 and downtown, bus route, hotel style, pool, fitness, ski valet, underground parking. Part of the Village, 405 Village Road, take Park Avenue from the traffic circle on the north end of Breckenridge, or at the three way traffic light on South Main, and turn into the Village at Breckenridge, just a block from that light. This arch-covered entrance will be on the south side of Park. Chateau Condos will be northwest of this entrance. An expert from Breckenridge Associates is waiting to help you navigate the local real estate market! Send us a message or call us at (970) 453-2200 to get in touch now.